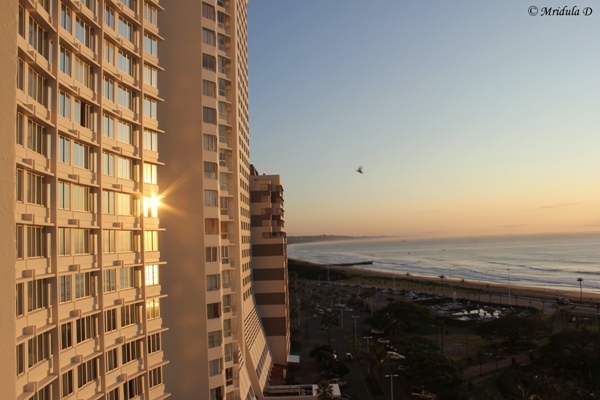 At Durban we were hosted at Southern Sun Elangeni and Maharani Hotel and it is right by the beach. I had a beach facing room too. I think a lot of rooms are beach facing at this hotel. As South Africa is three and half hours behind India I would easily wake up by 6.00 am, something I almost never do in India. That still meant waking up at 9.30 am in India. The sunrise used to be around 6.12 am and it was only the first day that was overcast, the other two days that I was there I had the privilege of watching the sunrise from my room window. And this is what I loved most about my room. When I would go to sleep I would leave the curtains open and love to wake up with the first light. The room was comfortable and every night they would leave a small chocolate by the bedside. No wonder I have gained weight during my trip to South Africa. There was kettle to make tea and enough provisions provided even if you wanted to have multiple cups like me. That is the hallmark of a good hotel to me, one that isn’t miserly about tea bags and milk sachets. The bathroom had a bathtub and was clean and functional. The hotel had a swimming pool which was visible from my room but I never got time to try it out. The breakfast was super lavish. It has sufficient options for both vegetarians and non vegetarians. Also it has low fat and normal options. Juices are freshly squeezed and coffee and tea is excellent. They serve both Earl Grey and South African Five Roses (we tried only these two). I had Five Roses almost every time. They give complimentary internet connection to the guests and this is one thing that could be better. Their net connection was a bit erratic when I was there for the Tourism INDABA 2013. It would go off and come back on its own, no major hassle but a small irritant. The beach is right across the hotel and you can easily walk to it. Overall, a decent hotel if you are looking for one by the beach.